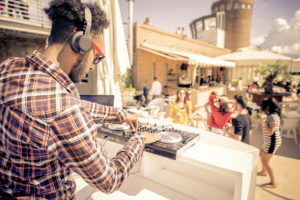 Working as a DJ can be a solid career choice if you love parties, music, and performing. But like all career choices, becoming a DJ doesn’t just happen. You need more than an excellent sound system, headphones, microphone, and collection of tunes. You’ll have to deal with a learning curve, building publicity and for some venues, getting a DJ license. So how do you make your business boom and go from playing friends’ living rooms to qualifying for mega-events? If you’re already working as a DJ, or even considering a career as a DJ, you’re likely already into both music and technology. Even so, it’s a bit of a jump from hobby to profession, and that can happen in a number of ways. While many DJs are self-taught, and simply practice at home and with friends, there are actual DJ training options out there. These days, most DJ courses are conveniently available online. They can help you learn important skills like creating remixes, building a set list, and more. In addition, you can learn the basics of DJ software, how to expand your DJ business, and even how to improve your onstage appearance. The truth is, it’s fairly unlikely that anyone will ever ask you about your DJ training credentials. Your proven track-record and skills are far more important when it comes to landing a job. Still, training courses can be helpful, building your confidence and improving your skills. Do DJs Need a License to Play Music? Once you decide to make your music passion a business, you’ll want to get booked for gigs. Most DJs start off at small venues like house parties and local bars. After that, you’ll likely move on, to anything from office parties to high school dances, private clubs, and wedding receptions. For these types of jobs, you don’t have to worry too much about a DJ music license. The venue generally will take care of things like ASCAP licensing, SESAC licensing, and BMI licensing which cover the necessary copyright and performance fees. However, if you want to play at public events, then you’ll probably need to cover your own DJ license to play music. This public performance license, of course, is in addition to the general small business licensing you’ll need in order to operate including a local business permit and state registration. Also remember in terms of licensing, as a business, you need to legally purchase your music. That means no free downloads. The bottom line is that in order to play music in public, you need a public performance license. So if you book a gig, make sure to check with the venue. In most cases, as detailed above, they’ll have you covered. If, however, they’re not covering you, then you’ll need to deal with the performance license yourself. How to get a DJ license is fairly simple – though a bit bureaucratic. You will need to be in touch with all three music licensing bodies (ASCAP, SESAC and BMI). You will then be expected to pay a portion of your revenues in royalties to the copyright-holders. This will be based on your playlist at each performance. If you are a busy DJ, you may want your office manager or personal assistant to handle getting a DJ license for you. You could also consult with a qualified lawyer or accountant to make sure you’re handling this properly. DJ insurance – Simply put, you need to protect your business; and to do so, you’ll need good liability insurance. A good liability policy will cover all sorts of unforeseen situations like a customer slipping on your set, or a drink spilled on your customer’s designer clothes. Excellent equipment – You are selling sound after all, so it better be good! Make sure to invest in the best possible equipment, and keep it up-to-date. Killer clothes – As a public performer, you’re also selling style. So make sure to create a style of your own. Hair, shoes, makeup, t-shirts, whatever you’re wearing should be 100% you, and match the vibe you’re looking to create. Competitive edge – Music is a seriously competitive art. So you’ll need to stay on top of the competition. Watch online, go to performances, and always try to either carve out a niche for yourself, or keep up with the trends. Clear niche – To attract customers, they need to know what you do; and this means defining yourself. So pick a niche (or two). Do you want to do big parties with the latest hits? Or do you prefer smaller affairs? Are you an 80s specialist? Or do you prefer 70s-style dance parties? Cash flow – You don’t need a huge amount of money to start a DJ business, but you will need some. Make sure to have a business plan sketched out. You should include your budget, expenses and income. Being a DJ can be fun, but if you’re making a business out of it, always remember to keep your eye on the bottom line.